When winter comes to an end and all that is beautiful blooms into season, thoughts turn to the great outdoors. Going to the park is always one outdoor event that I look forward to. I love feeding the ducks with my kids and having a football to toss back and forth. When it's time to take a break and have a delicious lunch we always look for the perfect spot and the perfect picnic table. There have been many times that I would wonder about accommodations for people who were wheelchair bound. I would look around to see whether they could sit and have a delicious lunch at a picnic table just like my family. Wheelchair accessible picnic tables can help facilitate not only those that are wheelchair bound but their families and loved ones as well. Every state and local park facility wants more visitors to enjoy their environment. Handicap accessible picnic areas are a prominent consideration for facility operators today. Providing wheelchair accessible picnic tables is now an easy process especially since ADA picnic tables come in a variety of shapes and sizes. We carry 8-foot standard ADA picnic tables with accessibility on either end of the table. 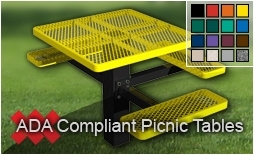 Also available are 46-inch round or square ADA picnic tables made with an attractive thermoplastic finish and a tubular steel understructure. This protective coating is rust, corrosion and scuff resistant. These factors are important when looking for the best quality and most durable picnic tables. Another point of consideration is the placement of your outdoor picnic tables. Some can be placed directly out in the sun. Other accessible picnic tables should be placed in the shade for those who may be photosensitive. Sitting in the sun may increase the risk of health issues such as dehydration, sunburns or other heat related illnesses. Certain medications or impairments may also increase sun sensitivity that could cause greater illness due to heat. Information such as maps, brochures and signage should be placed at the entrances to prevent long searches for the accessible area. Always keep in mind that every individual is different. If you are sensitive to the needs of others you can guarantee a more enjoyable environment and a more visited facility.